Or Akemashite Omedeto as they say in Japan. I hope that all my family, friends and readers enjoy a safe and happy New Year's Eve and that 2010 ushers in a great year for each and every one of you. 2009 was probably a challenging year for many of us, especially economically, and I hope that 2010 will bring better news and good fortune to all. No matter what happens though, we shall find a way to make 2010 a good year. For The Passionate Foodie, I resolve to try to make my blog even better. I have been making some changes here and there, all with the goal of improving matters. There will be plenty of food, wine and spirit items to cover in the new year. I already have numerous events scheduled to attend in January. If you have any suggestions for me, please leave them in the comments or email me. Thanks to all of my readers during the past year, and best wishes to you for the coming year, and I hope you will continue to read my blog in 2010. 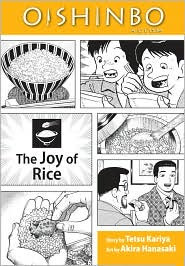 The sixth volume of the compelling Oishinbo series has just been released and is titled, The Joy of Rice. It deals primarily with rice, in all its varieties and preparations. This is an essential Japanese food and this book is both enjoyable and informative. Like the previous volumes, this book begins with a recipe: Scallop Rice. Then there are eleven chapters and also like the prior volumes, the back of the book has a series of notes, many dealing with Japanese terms, concerning the text. The first chapter centers on a challenge, trying to find a Ginza restaurant which will satisfy a millionaire gourmet. A homeless man is consulted for his expertise, as he sorts the garbage for many restaurants and eats the leftovers. He thus understand which restaurants have the best food. The meal ultimately served to the gourmet is a simple miso soup, bowl of rice and a dried sardine. Yet it thrills him, and you will have to read the book to know why. Chapters Two and Three deal with the differences of brown and white rice, including why organic brown rice may not always be good for you. Though pesticides may not be used in the actual farming, one also has to be careful about the source of the fertilizer one uses. Some manure may come from cows which had antibiotics. The leaves and grass used in compost may also have had pesticides used on it. If you truly wish to be organic, you must delve deeply into the sources of everything you use. That is a lesson that extends far beyond rice. Chapter Four then gets a bit scientific, with an explanation of the water absorption rate of rice, milling rates as well as the effects of humidity. This helps explain why rice does not always come out right when you cook it. Chapter Five is more political, an opposition to a policy which would liberalize rice imports in Japan, and potentially destroy an important element of Japanese culture. It also discusses worries about the safety of imported rice, and whether it might contain too many pesticides. In Chapter Six, we learn about the "Matsutake rice of the sea." Matustake are mushrooms, and sliced atop rice they make a very compelling dish. But sliced Tokobushi Abalone, which looks like Matsutake, tastes even better. Chapter Seven deals with takikomi gohan and maze gohan, both dishes of rice mixed with other foods. Rice is very versatile and can be combined with many other ingredients to create a wide variety of different tasting dishes. This theme continues in Chapter Eight with a discussion of oysters and rice. The final three chapters also follow the same theme. The final three chapters deal with a rice ball competition. Rice balls are an integral part of Japanese culture, and even figure into a number of folktales. They come in many different types, often a ball of rice with some type of meat, fish or vegetable in the middle. The typical Japanese rice is short-grained and sticky, which makes for a good rice ball. Asian long-grained rice though does not work, as once it gets cold, it often gets tough. The chapters provide many different examples of rice balls, showing their versatility and diversity. This volume of the series was once again fun and educational. I continue to recommend the entire series to any foodie. Unfortunately, there is only one more volume, Izakaya, that has yet to be released, and which will be published in January 2010. I do wish the series would go on and on. Girl Scouts of Eastern Massachusetts are presenting an intriguing event, Cookie Creations! The annual Girl Scout Cookie Creations fundraiser invites the area’s top chefs to use their famous Girl Scout cookies and whip-up a tasty dessert! This event will be held at two different locations, on two different evenings. Eastern Massachusetts’ top chefs including Aquitaine’s Matthew Gaudet, Aura’s Rachel Klein, Au Bon Pain’s Jens Retlev, Cakes for Occasions’ Kelly Delaney, Hawthorne Hotel’s Steve Nelson , Kick*ss Cupcakes’ Somerville Sara Ross, Locke-Ober’s Lydia Shire, Old Town Bread Company’s Doug Morris, Tremont 647’s Kat Craddock and many more will design desserts for their respective event. The desserts will be judged by New England Cable News’ TV Diner’s Jenny Johnson and Mix 104.1 Morning Show host Kennedy for the Boston event, and New England Cable News “Good Morning Live” co-host Karen Swensen and Colonel David L. Orr, Commander, 66th Air Base Wing, Hanscom Air Force Base for the Salem event. Event #1: Thursday, January 21, from 6p.m. to 8p.m. Event #2: Thursday, January 28 from 6p.m. to 8p.m. Cost: Tickets are $30 each or 2/$50. To purchase tickets, please visit www.girlscoutseasternmass.com, events@girlscoutseasternmass.org or call 857-453-5336. Saké production is finally coming to Europe. Though Saké is produced in place such as the United States, Australia and Canada, it had been previously unknown in Europe. But a Norwegian brewery is poised to be the first such Saké brewery. The brewery makes over 20 different styles of ales and export over 70% of their production. One of the beers they produce, Red Horizon, is similar to Saké in some ways. They fermented it with Saké yeast as well as fermenting it at low temperatures like Saké. This gives the beer the smell and fruitiness of Saké. Though I generally dislike beer, this is one that sounds very appealing to me and which I need to seek out. Kjetil learned about Saké brewing in Japan and is now ready for the next step, brewing their own this winter. They will even be using rice imported from Japan, the Hokkaido-grown Ginpu. The Saké should be available for sale next summer, primarily in Norway though some will be exported to Japan. Originally, Kjetil had considered growing rice in Norway but realized that was not realistic given the climate of Norway. This is exciting news, though it is unlikely we will be able to find this Saké anytime soon. But if there is enough demand, who knows what might happen. I am just pleased to see Saké becoming more widespread across the world. Join several North End restaurants for dinner on January 31 at the 5th Annual CityFeast and help benefit the Joslin Diabetes Center. Six North End restaurants, including Terramia, Antico Forno, Lucca, Prezza, Tresca and Taranta, will host special five-course dinners with wine pairings. Billy Costa of KISS 108 FM and NECN’s “TV Diner” will also make a special appearance. The dinners will be held on Sunday, January 31, 2010, from 6pm-9pm. Cost: $150 per person (which includes tax and gratuity and $100 of the ticket price is tax-deductible). Proceeds benefit Joslin’s High Hopes Fund, which supports Joslin’s efforts to improve the lives of people with diabetes—young and old—and to prevent and cure the disease. The Joslin Diabetes Center is the world's preeminent diabetes research and clinical care organization. Joslin is dedicated to ensuring people with diabetes live long, healthy lives and offers real hope and progress toward diabetes prevention and a cure for the disease. Founded in 1898 by Elliott P. Joslin, M.D., Joslin is an independent nonprofit institution affiliated with Harvard Medical School. To purchase tickets: Call Joslin's Development Office at (617) 732-2412 or (888) JOSLIN-2. I don't cook that often but I do enjoy baking cookies during the holidays. I may spend a day making an assortment of cookies, eventually sharing them with family and friends. I am also proud of the results, and think I make a pretty good chocolate chip cookie which gets raves from others. But this year I was very disappointed that my chocolate chip cookies were a bit of a flop, nowhere near my usual quality level. This year, I went over to my mom's place to bake cookies with her. I began by making my chocolate chip cookies and they came out overcooked, and did not spread out as they should. The main problem? A different oven and different pans. You may not think much about how you grow used to your own oven and pans. You understand how they work, their quirks, and the best times to let your items bake. That probably took some initial trial and error. But once you understand them, the baking comes easy. With my own oven, I know best how to bake my cookies. But when you use someone else's oven, it is like you have to start all over again. You have to learn that new oven's quirks and requirements. Your timing is off, and you must engage in more trial and error. And that is what I had to do. My chocolate chip cookies became an error which taught me about the new oven. So my later cookies came out better once I learned more about the oven. But the chocolate chip cookies were a loss. A cautionary lesson for all of us. If you are using another's oven for your cooking, just remember that it may not produce your best work until you understand it. Two years ago, The Greater Boston Food Bank designated January as Super Hunger Month and January 2010 will mark the return of the month-long series of fundraising events to help end hunger in eastern Massachusetts. 1 in 9 people in Massachusetts is currently receiving food from a food pantry, soup kitchen or shelter, and the colder months ahead mean that more people will be forced to choose between heating their homes and paying for food. Super Hunger Month provided an additional 350,000 meals to those in need last year. It will have added significance this year as even more people seek assistance during this jobless economic recovery. During this time period, culinary-themed packages and signature Boston experiences will be auctioned online with all proceeds benefitting The Food Bank. Former Food & Wine “Best New Chef” winners Barbara Lynch of Barbara Lynch Gruppo, Michael Leviton of Lumiere and Rialto’s Jody Adams will judge Food & Wine’s recent class of “Best New Chef” winners, including Gabriel Bremer of Salts and Mary Dumont of Harvest as they compete in a culinary showdown for the title of Super Hunger Chef 2010. The Super Hunger Chef Challenge will be hosted at the Four Seasons (200 Boylston Street) by its Executive Chef Brooke Vosika. Greater Boston’s finest restaurants will participate in The Greater Boston Food Bank’s signature event – Super Hunger Brunch – where restaurants donate 100% of their proceeds from that day’s brunch service with some restaurants also donating server gratuities. Most restaurants offer prix-fixe menus ranging from $25-$50/person. Participating restaurants include Bin 26 Enoteca, Blue Ginger, Café Fleuri, Chez Henri, Craigie on Main, The Elephant Walk, The Fireplace, The Grapevine, Grill 23 & Bar, Jasper White’s Summer Shack, La Morra, North 26 Restaurant & Bar, Rialto, L’Espalier, Rocca Kitchen & Bar, Sel de la Terre, Sibling Rivalry, Stella, Orinoco and Tosca Restaurant. For more information about all of these events should visit www.superhungermonth.org. Let me continue a review of my top recommendations and favorites of the past year, 2009. I have already provided a General Summary of 2009, my Favorite Restaurants of 2009, my Favorite Food-Related Items of 2009 and my Favorite Wine & Spirit Related Items of 2009. Now, this post, the final one in my 2009 Review series, will concentrate on Saké. Saké Dominance: Saké continues to maintain a prominent role on my blog. I am very passionate about Saké and I hope to promote it to others, to spread the word about this fascinating beverage. I want to destroy the stereotypes about Saké and shine a light on the truth, to show its diversity and complexity. During this past year, Saké popularity has been increasing across much of the world, including the U.S. I am going to highlight some of the most interesting Saké events that I have discussed on my blog. **Saké exports have been booming. Exports have grown from about 7,000 kiloliters in 2001 to 12,151 kiloliters in 2008. Exports to the U.S. have doubled since 2001 to 3,843 kiloliters. Exports to Asia are also increasing. There is more and more Saké around, and that is a great thing. **Moto-i, the first Saké brewpub in the United States, opened in Minneapolis. Owner Blake Richardson runs the place like a Japanese izakaya, serving small plates of food with namazake, Saké on draft. I have not yet been there but certainly love the idea of this place. **Philip Harper, an Englishman, is the only non-Japanese toji ("master brewer") and he works at the Tamagawa ("Jewel River") brewery. His Saké has just been released in the U.S. this year, and I am seeking it out, hoping to see what quality he can brew. **A new Saké, Rissimo, has been specifically designed to pair with Italian food. Matsumoto Sake Brewing Co. and Il Ghiottone, an Italian restaurant in Kyoto, formed an alliance to create a Saké with a subtle sour flavor like white wine which would thus pair well with Italian food. It is called Rissimo, as "riso" is the Italian term for "rice." Just think of risotto. **Saké was sold at the Opening Day of the San Francisco Giants at AT&T Park. In Japan, they sell Saké at major sporting events and now it is time for the U.S. to do the same. Hopefully other baseball parks will start selling Saké. **New York City held its first Saké Week from June 1-5. Over 100 New York restaurants participated, all helping to promote Saké. There were special events, including food pairings, tastings, education, and more. Hopefully they will do it again in 2010, and maybe other cities can follow their example. **Saké Day, October 1, passed once again with little occurring in the Boston area to commemorate this date. I hope to change that in 2010, by helping to organize some local events, and maybe even a large Saké tasting. Stay tuned for details, and any assistance is more than welcome. **Who would have suspected that Portland, Maine was a significant Saké destination? Not I, but I was pleasantly surprised to find a significant number of their wine/liquor stores carried Saké, and not just the cheap, common brands. They certainly carried more Saké than many of our local wine stores. **Even the Saké world is not devoid of scandal. A major Saké brewery, Bishonen Shuzoh Co., sent out expensive rice to be polished but received a much cheaper rice back, receiving money to make up for the difference in price. Customers thus unknowingly paid for a lower quality product. Fortunately, the brewery was caught. Saké Reviews: Over the past year, I have reviewed over 30 Sakés on my blog. A excellent opportunity to taste Saké was at the annual ULVino Grand Wine Tasting in Las Vegas. They had about eight tables with dozens of different Sakés available to taste. You don't often see so many bottles available for tasting in one place. Saké WBW: I was the host for Wine Blogging Wednesday #59, and chose to pay homage to Kushi no Kami, an ancient god of Saké. Participants had to conduct a kikishu (“Saké tasting”) by selecting any Saké and reviewing it. Over 30 Sakés were reviewed and discussed. Plus, we had two special guests, both well known Saké experts, who joined in on the Saké fun. John Gauntner, a famed Saké authority and educator, reviewed the Hakkaisan Tokubetsu Junmai-shu. Beau Timken, a Saké authority and the owner of True Sake, the first all-Saké store in the U.S, reviewed the Kikuhime Dai Ginjo. Favorite Saké: Though I have tasted many excellent Sakés this past year, one stood out as my favorite, the Manabito Kimoto Junmai Ginjo. Made by the Hinomaru Jozo Brewery, which is owned by Jouji Sato, it was quite unique, very different from any other Kimoto I have had. Complex, well balanced, hints of earthiness and extremely delicious. This gets my highest recommendation. Favorite Sparkling Saké: These are usually simple, slightly sweet and pleasant drinks but the Mizbasho "Pure" Sparkling Saké is a significant exception. The brewery actually uses some of the French Champagne methods to create this Saké, such as an in-bottle secondary fermentation. This is a serious sparkling beverage, on par with a good, dry Champagne. At $50, it is not cheap, but its high quality warrants such a cost. Favorite Store for Saké: For the second year in a row, Sakaya in New York City remains my favorite place to buy Saké. The store only sells Saké, Shochu and Plum Wine and the owners, Rick and Hiroko, are personable and very knowledgeable about Saké. With about 100 choices available, I have not yet been disappointed in anything I have purchased. If you love Saké, and visit New York City, you must stop at Sakaya. Local Stores for Saké: In the Boston+ area, finding good Saké can be difficult, but the situation is improving. Wine stores seem to be stocking more and more Saké, and this pleases me immensely. I hope that 2010 sees even more Saké promotion. Here are several local wine stores which carry some good Sakés and which deserve your support: Lower Falls Wine Co., Ball Square Fine Wines & Liquors, Wine Connextion, Golden Goose, and Beacon Hill Wine & Gourmet. I hope to expand this list in 2010. Most Expensive Saké: The Naniwa Isake 19 Junmai Daiginjo, at around $750, may be one of the most expensive Sakés available. What makes this brew so special is that it has a seimai buai of 19%, meaning that 81% of the rice kernels were polished away. This may be the lowest polishing rate available, possible only with modern technology. It is not currently available in the U.S., though at its high price, few of us could afford it anyways. Favorite New Saké Book: Though there exist only a small number of books on Saké, the winner of this category definitely deserves the accolades. Saké's Hidden Stories: The Personalities, Philosophies, and Tricks-of-the-Trade Behind the Brew, a new E-book by John Gauntner, is a fascinating look at thirteen Japanese breweries. It even includes an informative, short primer on the basics of Saké. Gautner has a casual, easy writing style and he has filled the book with plenty of compelling stories. I highly recommend this book! Runner-Up Favorite New Saké Book: If you want a fun and informative introduction to Saké, then check out Oishinbo: Saké. It is a manga, a Japanese comic, and worthy of your attention. It provides plenty of basic information and might also get you thinking about comparisons and contrasts between Saké and wine. Important Saké Campaign: I recently won a t-shirt from SakéOne with the sentiment, Drink Saké Not Bombs. I was especially pleased as I am proud to support this position, to stand against the dreaded Saké Bomb. The Bomb, dropping a shot of Saké into a beer, essentially destroys the subtle flavors of the Saké. Would you pour a shot of a fine Burgundy into a glass of cola? For more Saké related items, you can check my blog posts for the past year. Obviously I could not include everything in this review post. You can also look forward to many more Saké posts in 2010. Let me continue a review of my top recommendations and favorites of the past year, 2009. I have already provided a General Summary of 2009, my Favorite Restaurants of 2009 and my Favorite Food-Related Items of 2009. Now, this post will concentrate on my favorite wine and spirit related items. My last review post, on Saké, will get posted very soon. Favorite Discount Wine Store: With our tough economic times, price is very important so discount wine stores are especially prominent. For the second year in a row, Bin Ends, a discount wine store in Braintree, takes this honor. With some of the best wine prices around, a diverse selection and knowledgeable staff, this store is a must visit. Plus, the store is at the top of using social media, not only to promote themselves but also to engage in a dialogue with wine lovers and their customers. Favorite New Discount Wine Store: Though only open for a few months, the Wine Connextion, in North Andover, is making a strong beginning. Their wine prices are incredibly low, they have about 700 different wines and they sell Saké. With time, this store should get even better, adding some esoteric wines and high-end spirits. Runner-Up New Discount Wine Store: Though I was initially very skeptical, I was pleased to see that my worst fears were not realized at the new wine/liquor store at the Stoneham BJs. Their prices are low, their selection gets better all the time, and they have plenty of free wine tastings. This is another wine store you should be checking out. Favorite New Boutique Wine Store: For an adventurous wine lover, the opening of Central Bottle in Central Square, Cambridge, was a welcome blessing. With an intriguing collection of artisan and small producer wines, with about 90 at $15 or less, this is the place to find plenty of exciting wines. Plus, they sell cheese, meats, cicchetti, bread and more! The staff is knowledgeable and passionate and the store has a full list of upcoming events, including Thursday night Wine Bar. Make this one of your wine destinations. Favorite New Suburban Wine Store: When Melrose finally allowed three stores to sell wine in town, Beacon Hill Wine & Gourmet (which also has a Boston location), was one of the three. With a good selection of wine, including Saké, and gourmet foods, including a cheese counter, they are a very welcome addition to the local area. They have regular wine tastings and have plans for much more in the coming year. Favorite Suburban Boutique Wine Store: I first visited the Belmont branch of Vintages: Adventures in Wine this year. It has an exceptional selection of more artisan and esoteric wines, all reasonably priced, with an emphasis on Italian wines. Plus, they have some outstanding wine tastings, some with the wine makers. An excellent wine lovers destination. Favorite North End Wine Store: Kerri Platt, the owner of the Wine Bottega has made this North End institution an even more compelling wine store. Great selection, excellent wine tastings, a knowledgeable staff and lots of passion. If you are visiting the North End, make sure to stop by the Wine Bottega. Favorite Portland Wine Store: I visited several wine stores in Portland, yet only one really stood out, the Browne Trading Gourmet Market. I was surprised by the diversity of their wines and Saké, including plenty of high-end wines. Prices were reasonable and the front of the store also sells gourmet foods, fresh fish, produce and more. One stop shopping for your food & wine needs. Favorite Local Winery: The Travessia Urban Winery is located in downtown New Bedford, and produces wines using only Massachusetts grapes. The owner Marco is a passionate man, truly interested in producing the best wines that he can. And he has been producing some very good wines, at reasonable prices. Tour the winery and taste the wines and you too will understand why I like this winery. Favorite Vermont Winery: This year, I got to taste wine from a number of Vermont wineries and one most impressed me, the Boyden Valley Winery. They only use Vermont grapes, hybrids, and the wines are delicious and reasonably priced. Their Vermont Ice Red, made from Frontenac, is even one of the best ice wines I have ever had. If you are in Vermont, seek out their wines. Favorite Long Island Winery: While at TasteCamp, we visited several different Long Island wineries. My favorite winery was Paumanok Vineyards, which produces some killer wines including their Chenin Blanc and Petit Verdot. A close runner-up was Shinn Estates, which served us superb duck breast and makes a superb Cabernet Franc. Both of these wineries show the high quality that Long Island wines can reach. Favorite Wine Dinner: This was a tie as it was just too difficult to choose only one wine dinner. First, there was the dinner at Bistro 5 with Paolo De Marchi, a famed Tuscan wine maker who owns the winery Isole e Olena. Great wines, food and company made this an exceptional evening. Second, there was the dinner at Erbaluce where Chef Draghi chose some very unusual Italian wines to pair with his always superb cuisine. The marriage of wine and food can be so exciting. Favorite Wine Maker Tasting: Christoph Künzli, the winemaker of Le Piane in the Boca region of the Northern Piedmont, came to Boston to showcase some rare wines, aged Nebbiolo produced by Antonio Cerri. These were incredible wines and Christoph is such an amazing man, humble and passionate. Adonna Imports arranged the tasting and the Cerri wines are now available for sale. Favorite Wine Tasting: It is very rare for me to attend a tasting of 20+ wines and like every single one of them. But it happened this year at a tasting of boutique wines from Israel. Wineries such as Tzora, Margalit and Tulip presented interesting and delicious wines and showed the true potential of Israel to produce excellent wines. Thanks to Richard at Israeli Wine Direct for arranging this tasting. Runner-Up Favorite Wine Tasting: I found some excellent and exciting wines at the Wine Riot 2, including a few of my favorite wines of the year. Held at a local courthouse, a funky venue, the event was not overly crowded so it was fun to stroll through the tasting tables. There were wine classes, music and other amusing activities. There just needed to be more food available, including some freebies, to help people cleanse their palates as well as not get too intoxicated. Favorite Wine Party: One of the highlights of the Boston Wine Expo weekend did not even take place at the Expo. It was a special Expo After Party held at the Boston Wine School, an intimate party with wine lovers, bloggers, wine makers, distributors and more. There was plenty of delicious food (including some superb duck breast), interesting wines as well as lots of enjoyable conversation. Favorite Wine Magazine: Decanter, a British wine magazine, continues to impress me with its extensive coverage of many less common wine regions, often ignored or marginalized in other wine publications. Plus it has an amusing wine cartoon in every issue. I eagerly look forward to each issue of Decanter. Strangest Wine Item: Should you drink wine based on the rhythms and configurations of the moon, planets and constellations? Some people believe, based on biodynamic principles, that there are specific days best suited to taste wine. Wine is supposed to taste best, with the most flavor, on "fruit" days and taste the worst on "root" days. I am very skeptical of this idea but it certainly intrigued me. Favorite Wine Trend: We are starting to see the production of some high-quality Boxed wines and I love the idea. Besides being better for the environment, they are convenient, long lasting and inexpensive. Even some of the best local wine stores are starting to carry these boxed wines, a good indication that boxed wines are making their mark. Wineries, let us see more high quality box wines! Favorite Single-Topic Wine Book: I love the Pinotage grape so was very excited to see the publication of a book this year devoted to Pinotage. Pinotage: Behind the Legends of South Africa's Own Wine was written by Peter May, the author of The Pinotage Club blog. The book is well written, informative and highly recommended. Read the book and drink some Pinotage. Favorite Multi-Topic Wine Book: I do love learning esoteric facts about the world of wine so I was captivated by Is This Bottle Corked? The Secret Life of Wine, written by Kathleen Burk and Michael Bywater. This book contains over 85 short articles about a wide range of wine-related topics, an an eclectic mix of topics covering education, entertainment, history, literature, science and much more. This is a very fun and informative read. New Wine Tasting Notes: I am excited that I have begun writing a new style of wine tasting notes for some of my reviews. I began using the new notes with the 2008 Heidi Schrok Muscat and have continued with several others since then. So far, thise new style of tasting note has been well received so I will continue using it in 2010. Favorite Las Vegas Bar: With very professional and skilled bartenders, and a diverse selection of rums and spirits, the Rhumbar at the Mirage Hotel is a recommended destination. I have had numerous excellent cocktails here, as well as sipped some high-end rums. You can sit inside or at their outside patio. Favorite Alcohol History Book: The King of Vodka by Linda Himelstein presents a biography and history of Pyotr Arsenievich Smirnov and the vodka company he created, extending from the early 19th century through today. It is a fascinating story, how a serf became a very wealthy man through sales of vodka. Through Pyotr's story, we also see some of the history of Russia, the significant changes that occurred during the 19th century. Favorite Cocktail Book: Check out Vintage Spirits and Forgotten Cocktails: From the Alamagoozlum to the Zombie 100 Rediscovered Recipes and the Stories Behind Them by Ted Haigh for a fun and informative look at largely forgotten cocktails. It provides plenty of recipes, as well as background information on all of them. Enliven your next party with this unusual recipes. Favorite New Liquer: At Cochon 555, I first encountered Domaine de Canton, a French Ginger Liqueur. The Watermelon Mojito made with this liquer was quite delicious, the ginger not overwhelming the cocktail. Ginger can be a very refreshing flavor, and can add a nce touch to certain cocktails. Favorite New Vodka: I was surprised when I first tasted Sobieski Vodka, a very inexpensive Polish vodka. For the low price, I was not expecting such a high quality vodka, nearly good enough for me to drink straight. At about half the price of Absolut or Smirnoff, it actually delivers twice as much flavor. This is my new every-day or party vodka. May the glad tidings of the season shine on you, your family and friends. May your celebrations be fruitful with good people, excellent conversation, delicious food and fine drink. May you give gifts that are well appreciated and which bring joy to your loved ones. May you thoroughly enjoy whatever holiday you celebrate at this season. This is one of my favorite times of year. I love sharing the holidays with my family and friends, enjoying their company as we eat and drink to celebrate the season. It should be a joyous occasion, reveling in all of our blessings. For no matter what ills there may be, there still is much to appreciate. And that appreciation deserves recognition and sharing. Drink and dine with passion this holiday, as well as every day of the year! Let me continue a review of my best recommendations and favorites of the past year, 2009. Two days ago, I provided a list of my Favorite Restaurants of 2009 and now I want to address my favorites for other Food-Related Items, from markets to books, from ingredients to desserts. Future posts will discuss my wine, spirit and Saké favorites. Favorite New Ethnic Market: If you are seeking authentic Spanish foods, especially cheese and pork products, then you must drop by Las Ventas in the South End. Owned by the proprietors of Estragon restaurant, this small market has an excellent variety of Spanish items, such as over 25 cheeses, the famed Jamon Iberico de Bellota, chorizo, sandwiches and much more. Check out my prior reviews here and here. Favorite New Local Butcher: Though it has only been open for a few months, the Olde Redding Butcher Shoppe in Reading is already making its mark. It is more of an old fashioned butcher shop, with a great assortment of meats, a deli, reasonable prices and excellent service. I am getting my Christmas roast from them this year. Favorite New Local Bakery: Another new business located in Reading, Swiss Bäkers has a wide assortment of delicious Swiss products. Their baking philosophy is simple and compelling: Authentic, fresh, and natural. From their Berliners (like a light donut) to their Pretzel rolls, to their Croissants to their Linzer cookies, you have plenty of tasty options. I am buying some of their products for Christmas too. Favorite Local Chocolate Makers: Taza Chocolate, located in Somerville, is a more unique chocolate making company that produces chocolate using traditional Mexican, stone-grinding methods. This often gives the chocolate a very distinctive texture. Plus it is just very tasty. They also are very concerned about sustainability issues, which certainly gives another reason to support them. Their chocolate is available at many local stores so keep an eye out for them. Favorite Chips: I love potato chips, tortilla chips and similar other chips. But my new favorites are now the chips made by Food Should Taste Good, Inc. They produce several different types of chips including my favorites like Sweet Potato and Jalapeno (which I love to cover with a layer of melted, Mexican cheeses). These chips are also gluten free, cholesterol free, certified Kosher, dairy/lactose free, have no trans fats, and have no genetically modified ingredients. Favorite New ingredient: An intriguing and versatile ingredient, Black Garlic has really impressed me. It has been fermented, becoming almost jelly-like in consistency, and has a sweeter rather than pungent flavor. I think it goes very well with seafood dishes, though it can be used for any type of meat or poultry, or even non-meat dishes. Favorite Vegetables: Yes, this might seem an odd category for me but I do eat some vegetables. And pickled veggies certainly taste good to me. Vermont Pickle makes a variety of delicious pickled vegetables, from carrots to snap peas. Some of these veggies also come in an intriguing Hot variety. Their pickled garlic is also one of my favorites, another versatile ingredient. Favorite Cheese: I tried a lot of cheese this year, especially at the Vermont Cheese Makers Festival. Out of all that cheese, though I enjoyed most of them, one stood out among all the others, possessing such a powerful, complex and compelling taste. The Grafton Clothbound Cheddar, made in Vermont, is just amazing and gets my highest recommendation. Favorite Cookies: Do you love coconut macaroons? I certainly do and Klara's Gourmet Cookies make exceptional ones. A crisp, crunchy exterior leads to a very moist interior, just the right balance of textures. The taste is absolutely delicious, that rich coconut flavor that pleases the senses. Favorite New Meat: With all the uproar over beef, maybe you should branch out a bit and try other meats. You need to consider Yak meat, which is healthier for you than beef and which tastes very good, like beef but leaner. I had some delicious yak burgers and later learned that there is a Vermont Yak Company, where you can get local yak meat. One of my plans for 2010 is to visit this yak farm. Favorite Non-Alcoholic Drink: One of my biggest finds at the UNLVino Grand Wine Tasting event was not even a wine. It was the Republic of Tea bottled Iced Tea, fresh brewed, unsweetened, and flavored with fruit. Their iced tea tastes as good as actual fresh brewed and unlike any other bottled iced tea I have ever tasted. I could easily drink bottle after bottle of this refreshing and tasty brew. Favorite Food-Related Bookstore: Take the drive to Portland, Maine and stop at Rabelais, a compelling food and wine book store. It has a comprehensive selection of titles, both new and used, as well as special collectible books.For food and wine lovers, it is a treasure trove where you will likely find plenty of books you want to buy, including some you have not found elsewhere. Favorite Sushi Book: With its beautiful photography and extensive information, Sushi: Food for the Eye, the Body, and the Soul by Ole G. Mouritsen is an excellent book. It combines philosophy, science and practical advice, helping you learn how to prepare sushi. Most Fascinating Food Book: The winner of this category was quite clear to me. The Fruit Hunters by Adam Leith Gollner captured my attention from the start, and each page was more and more fascinating. I learned so much about the world of fruit, all of it interesting, and Gollner has written a fantastic and detailed book which I cannot recommend enough. Favorite New Food Magazine: This was another easy winner to determine. Culture: The Word on Cheese is an amazing magazine all about cheese. The articles are well written, interesting, cover many topics and is supported by some beautiful photography. I eagerly await each new issue and I have written about most of their issues, including #2, #3 and #4. Favorite Food Comic Book: U.S. comic books are mainly about superheroes but Japanese ones, called manga, cover a much wider range of subjects, including food and wine. Oishinbo, (roughly translated as “The Gourmet") is a best selling food/cooking manga in Japan and an abbreviated compilation of the series has recently been published in English. The various volumes that have been published to date include Japanese Cuisine, Saké, Ramen & Gyoza, Fish, Sushi & Sashimi, and Vegetables. These are fun and informative reads which I strongly recommend you check out. Favorite Food Controversy: Do you enjoy foie gras? Or are you opposed to it, thinking it is cruel? I explored a number of aspects of this controversy including: a review of The Foie Gras Wars (a new book by Mark Caro), information about foie gras, a discussion of the debate, and a potential ethical foie gras. This is not a simple issue but it is fascinating and well worth exploring. Favorite Chef Information: In 2009, I began the Culinary Creativity series, a series of interviews with local chefs, trying to determine the source of their inspirations. How do they create new dishes and recipes? Their answers were compelling, and show a wide difference of opinions and experiences. I hope to add more interviews to this series in 2010. Favorite Food Festival: Though it was not perfect, the Vermont Cheesemaker's Festival was still a worthy event. There were tons of different cheeses, Vermont wines, and other local food products. I ate more than my fill from all of the samples and found some new favorites and treasures. I will attend the festival again next year and recommend you should go as well. Favorite Local Food Blogger: I first encountered Jacqueline Church of the Leather District Gourmet at a blogger dinner in January 2009. Besides being a captivating dining companion, she writes an excellent blog about food, wine and spirits. Her work is well-written, informative and often with a touch of humor. A significant portion of her work deals with sustainability issues and she is currently working on a book on Heritage Pigs. If you are not following her blog, then you are missing out. New Food Short Story: This year, I wrote a new, food-related short story, called "You Had Me at Foie." This is a love story where foie gras plays an important role. Yet it also a mystery, with an ending that should make you think. I hope you enjoy this story and would like your feedback. New Cheese Haiku: Cabot Creamery held a Haiku contest where you had to submit a haiku about the Creamery or its products. One of my submissions was a runner up and you can check it out. I hope you enjoy it too. For more food-related reviews and highlights, you can check my blog posts for the past year. Obviously I could not include everything that I enjoyed in this review post. Today is a new Wine Blogging Wednesday, #64 and the theme is The Other Holidays. Jeff Stai, owner of Twisted Oak Winery, blogger at El Bloggo Torcido and rubber chicken lover is this month's host and he chosen a holiday theme, though with his trademark twist. Jeff stated: "Pick any winter holiday or observance EXCEPT Hanukkah, Christmas Day, Kwanzaa, or New Years Day or Eve, and choose a wine to celebrate it! For purposes of this WBW, the holiday date chosen must be between December 7, 2009 and January 7, 2010." It might take a little research to find one of these other holidays or observances, but I think it was a fun theme, with plenty of options. As I was pondering which holiday to choose, I was also reviewing all of my blog posts for the past year. I have been working on compiling my 2009 Favorite Lists. One of my posts from last January caught my eye, about an intriguing observance that is very appropriate for this WBW theme. January 5 is National Whipped Cream Day! Though I was unable to confirm the exact origin of this observance, it seems likely related to Aaron Lapin, the creator of whipped cream in a can. January 5 is Lapin's birthday. He was originally a clothes salesman but got into the food industry in the 1940s. He started selling Sta-Whip, a wartime substitute for whipping cream, and eventually put whipped cream into a new type of aerosol canister and called his product, Reddi-wip. Reddi-wip was first sold through local milkmen but it went national in 1954 and is still available today. Who doesn't love whipped cream? Though home-made whipped cream is the best, canned whipped cream is very convenient. With the holiday season, whipped cream is ubiquitous, on hot chocolate, pies, waffles and much more. Which wine should you pair with whipped cream? It depends on the food that accompanies the whipped cream though dessert wine is probably a good, general recommendation. So that is what I chose. The 2007 Alois Kracher Beerenauslese Cuvee (about $35/375ml) is an Austrian dessert wine. Beerenauslese is an official term for a late harvest dessert wine, usually produced from botrytized grapes. This Cuvee is a blend of 70 % Welschriesling and 30 % Chardonnay. Welschriesling is a white grape and its name literally means "Romanic Riesling" though it is unrelated to the common Riesling. It grows throughout Central Europe, often known by other names including Riesling Italico, Laski Rizling and Grasevina. It is a versatile grape and can make fine still wines or rich dessert wines. This wine was 80% fermented and aged in stainless steel, the other 20% spent in big casks for about 16 months. It also has an alcohol content of 12%. I dip my spoon into a bowl of diced fruit, a melange of apricots, pineapple, peaches, and lemons. There is a light glaze of honey atop the fruit, enough to add some sweetness without being cloying like the juice you find in canned fruit cocktails. There seems to be a crispness to the fruit, a nice balance to the sweetness of the dish. I take my time eating, as after each spoonful, the flavors linger in my mouth and I just sit and savor them. What a wonderful fruit cocktail, and a very pleasant finish to my evening. That sums up my feelings for the 2007 Alois Kracher Beerenauslese Cuvee. My new column of "A Passionate Foodie" can be found in the December 23 issue of the Stoneham Sun newspaper. This is a weekly column that concentrates on reviews of local restaurants though it also sometimes touches on other food and wine topics. The new column has been published today and will be available online soon. The new article is a review of Wine Connextion, a new discount wine store in North Andover. They have some of the lowest prices you will find around, plus a good variety of wines. This is the place to stock up on wines. Let me continue a review of my top recommendations and favorites of the past year, 2009. Yesterday, I provided a General Summary of 2009 and now I want to touch on some more individual events and items, including some of my favorites in certain categories. This post will concentrate on my Restaurant favorites. Future posts will discuss my other food, wine, spirits and Saké favorites. Favorite Brunch, Traditional Fare: For bacon and eggs and similar such fare, you must check out brunch at Craigie on Main. They put their own spin on this traditional fare, turning the simplest of dishes into a wondrous delight. Besides the usual fare, they also have some nontraditional items which are equally as delicious. It is a place to take someone you wish to impress. Favorite Brunch, Non-Traditional Fare: For a tasty, albeit non-traditional, Dim Sum weekend brunch you must go to Myers & Chang in the South End. They have plenty of creative and tasty Asian small plates, for only $3-$6 each. Sit at the counter and watch them cook and prepare our food. I have eaten more brunches here this year than anywhere else. Favorite Decadent Breakfast: The Lobster & Swiss Cheese Omelet at Becky's Diner in Portland, Maine, is certainly not your usual breakfast. But the sweet lobster meat, of which there was plenty, really makes for a great filling for the cheesy omelet. And at only $13.95, it was a good value too. Why not splurge for breakfast? Favorite Asian Restaurant: Besides their Dim Sum brunch, Myers & Chang serves excellent food for lunch and dinner. Plus they have a full bar, with interesting specialty drinks and Saké. And did you know that about 85% of their clientele is women? Men take notice! Favorite Asian Buffet: For only $10, you can order the Japanese/Chinese lunch buffet at the new Taipei Tokyo Cafe in Woburn. You'll find everything from sushi to dumplings, fried rice to chicken fingers. They bring out small portions of each dish, which helps ensure the food stays fresh, and they continue to restock the dishes when they empty. As it is a bit under the radar, it is never overly crowded like some other Asian lunch buffets. Favorite Local Asian Dish: U-Me, a new Asian restaurant opened in Stoneham this summer. Their Szechuan Wings just blew me away. Very crispy and meaty chicken wings, slathered with a sweet and slighty spicy sauce, are so much better than the usual chicken wings you find elsewhere. They are so addictive, I have to order them nearly every time I dine here. Favorite Local Restaurant: For the second year in a row, Bistro 5, in Medford, is my favorite local place. Chef Vittorio creates intriguing cuisine, with the freshest of ingredients, and the restaurant has an intriguing wine list. This past year I have attended some excellent wine dinners there, including an Heirloom Tomato Dinner, Spirited Gourmet Dinner, and Paolo de Marchi Dinner, all of which really pleased my palate. Favorite New Local Restaurant: I was extremely pleased this year at the return of one of my favorite Chefs, Steve Bell, to the newly opened Bobby’s Grille in Wellesley. The restaurant reminds me of the former Savory Tastes Cafe and the food is equally as compelling. Prices are reasonable, the food is plentiful and I think this restaurant will only continue to get better. Kudos to Chef Bell! Favorite Italian Restaurant, Innovative: Though you can find plenty of traditional Italian cuisine in Boston, it is much more difficult to find something innovative. For the best of the innovative though, you must seek out the cuisine of Chef Charles ("Chuck") Draghi at Erbaluce. His ever-changing menu items do not rely on butter, cream or oil, and his food thus seems much lighter but without any sacrifice of flavor. Plus, his Italian wine list is superb, with many esoteric choices. Favorite North End Restaurant: There are plenty of options in the North End, so where should you dine? Well, I have thoroughly enoyed Antico Forno, located on Salem Street, a bit off the beaten path. With its brick oven, the restaurant adds an interesting twist on many of their dishes. They also have an excellent, thin crust pizza. With reasonable prices, and a newly renovated interior, this is fine choice. Favorite Pasta Dishes: From the Papardelle with Bolognese to the Chestnut Bigoli, Sportello is making an impressive debut. Another piece of Chef Barbarba Lynch's culinary empire, this restaurant is located in the Fort Point area of Boston. The pasta and sauces perfectly complement each other, and the casual, diner ambiance of the restaurant is quite fun. Favorite Southern Restaurant: A new southern restaurant, Tupelo, opened in Cambridge this year, near Inman Square. You'll find cheap, delicious fare including the exceptional fried grits! With some of their desserts coming from Petsi Pies, you will enjoy your entire meal, from appetizers to desserts. It is a small, casual place and has recently started serving brunch. Favorite New England Steak House: Though Boston has plenty of very good steakhouses, it was a restaurant in Connecticut that impressed me the most this year. The David Burke Prime Steakhouse, at Foxwoods Casino, warranted two posts, one to discuss the place and the other to describe the food. Their dry-aged steaks are exceptional, as is most of their other food. From their caesar salad served tableside to their creative desserts, you will savor each bite. It is not cheap, but is well worth the price. Favorite Las Vegas Steak House: My meal began with the Bone Marrow Flan, an intriguing and tasty appetizer. From the start, I was impressed. Cut, Wolfgang Puck's Steakhouse in the Palazzo, is a pricey but excellent steakhouse with fine food, excellent service and a lengthy and appealing wine list. It is also well worth a splurge. Favorite Las Vegas Restaurant: Raku, a hidden jewel, is a superb Japanese restaurant located off the strip. The food is authentic, fresh, reasonably priced and absolutely mouth watering. Plus, they have a killer Saké list. You would probably never stumble across this place on your own. It is the type of place that you would never know about unless someone personally recommended it to you. Make reservations as this small place often fills up, especially on the weekends. Favorite Vermont Restaurant: Seeking a fine French restaurant near Burlington, Vermont? Then make reservations for Café Shelburne, located just outside Burlington. It is a homey place, with traditional French fare, often using local ingredients. I was really impressed with their restrained use of sauces, never overwhelming any dish but ensuring each dish was extremely flavorful. Favorite Carnivore Dinner: The Whole Hog Dinner at Craigie on Main was amazing, from the food to the company. With Jackie and David, fellow foodies, bloggers and pig lovers, we devoured many different parts of a pig, from the skin to the brains. Chef Maws certainly knows the best ways to prepare every delicious organ and body part. Craigie on Main is a great place for any special occasion, or just when you want something different. Favorite Desserterie: This was once again an easy choice and for the second year in a row, the award goes to Le Patissier, located in the Troquet Restaurant in Boston. Pastry Chef Sarah Woodfine remains as talented as ever and continues to create innovative and fantastic-tasting desserts. I also don't think it receives enough love from the local culinary community, though I can't recommend it enough. Favorite Dessert: The bread pudding at the Spiga Trattoria Italiana in Needham is heavenly, and almost makes you want to order it first, before your dinner. Chef Marisa Iocco has transformed this simple dish into something exceptional. You can even try to make the recipe at your own home. Favorite Cheap Lunch: For only $5, you can go to the Prince Pizzeria and get their all-you-can eat buffet of ziti, garlic bread and pizza. It is a Rt.1 institution which is disparaged by some, but it is a place I recommend. I like their style of pizza, and they offer plenty of different pizza toppings at the buffet. For $5, you will find difficulty finding a better buffet. Favorite Local Value Dinner Menu: L'Andana, in Burlington, is one of my favorite Italian restaurants, although their dinner menu is a bit pricey. But this year, they introduced their Enoteca menu in their bar/lounge area, a menu of inexpensive small plates. The tasty, high quality food is well worth checking out and the prices won't break your wallet. Favorite Pizza: The Za Za Restaurant in Saugus makes a unique pizza that I have never seen before, a Bolognese pizza. It was very tasty, with plenty of ground meat, and a fine sauce. I don't know why other places haven't made this type of pizza before as I think it would be very popular. Favorite Comfort Food: Winter is an especially important time for hot, comfort food, though it has its importance year round. Shepherd’s Pie has long been one of my favorite comfort foods though I am often disappointed with what I find at many restaurants. Until this year. Stearns & Hill Bistro in Melrose makes maybe the best Shepherd's Pie I have ever had, with multiple types of ground meat, a savory gravy, and melted cheese atop the potatoes. It is also very reasonably priced and available for lunch and dinner. Favorite Comfort Appetizer: You might expect Buffalo Chicken Rangoons to be found in an Asian restaurant, but they are actually at Burton's Grill. With a great crunchy wonton wrapper, the interior is a mix of spicy buffalo chicken and bleu cheese. They are also quite large and I would order these again and again when I return there. Favorite Holiday Dining Experience: Holiday dining can sometimes be overly expensive and unfulfilling. But the Santa Brunch at The Beehive was excellent on several levels. They had their usual brunch menu, at their usual prices, and there was no fee to see Santa or take your own photos with him. Excellent food, excellent service, and lots of fun. Favorite Dining Experience: For the second year in a row, my favorite dining experience was not at a restaurant, but rather at the chef's home. The Chef's Table dinners, hosted by Chef Peter Ungar of The Dining Alternative remain one of the best culinary experiences in the Boston area, yet still under the radar of many. This year, I even got to choose the menu for one of the Chef's Table dinners and it was a phenomenal meal, satisfying on so many different levels. For 2010, you should definitely make plans to attend one of these dinners. For more restaurant reviews and highlights, you can check my blog posts for the past year. Obviously I could not include everywhere that I ate in this review post. What were some of your favorite restuarants this year? 'Tis the season to be merry! But one thing that does not make me merry during this season are overpriced, holiday restaurant meals. Many places have special menus for Christmas Eve, Christmas Day and New Year's Eve. These are often pre-fixe dinners, set menus, but at a higher than usual price. That is especially true of New Year's Eve. For that higher price, you often don't get what you pay for. The food too often is mediocre, service may be poor and you might be rushed because you have to be done before the next seating. It seems the higher prices are sometimes merely motivated by greed. So why waste your money? What you should be is be far more selective in where you dine on these holidays. There are restaurants that still offer reasonably priced and delicious meals, though you might have to take some extra time to find them. I suggest trying restaurants that are a bit off the beaten path. The most popular places often are not the best choice. Check out the menu beforehand and assess whether the price is appropriate. Ask around for suggestions from friends and family. I don't know where I will be eating this New Year's Eve. I still am checking out my options, trying to find a place I will enjoy that evening. I hope I find a treasure rather than some overpriced disappointment. I have had luck doing so in the past and hope that luck continues this year too. What are your plans for the holiday meals? 2009 has been another exciting, interesting, busy and delicious year for this passionate foodie. I have dined at a number of new restaurants, tasted many new wines, traveled some, and expanded my knowledge of food, wine, blogging and writing. Once again, I have many fond memories. So as 2009 nears its end, I want to spend a little time to look back at this past year, to savor some of my favorite memories and achievements. I have already provided three summary lists for 2009, my Top Ten Wines Under $15, Top Ten Wines Over $15 and Top Ten Wines Over $50. Now it is time for a general summary of the past year, a rundown of several key events. These are some of the most important food and wine events of the past year for me. Please note that there will be some more specific 2009 food, wine and Saké posts coming very soon. Back in June, I introduced a new feature on my blog, Monday Rants. Every Monday, I post about something that irritates me, a food or wine issue that bothers me for some reason. Sometimes they are small, more personal issues and other times it is far more serious. I am hoping to start a discussion, to see if others feel the same way too or if anyone disagrees with me. I have had some people contribute, providing their own slants on the issues and I hope that even more people will enter the discussions in the new year. 1) This year, I visited Las Vegas twice, once in the spring and once in the fall. As last year, I attended the UNLVino Wine Tasting, a huge three-day wine tasting event. I reviewed many of the different wines and Sakés that I tasted. During my Vegas trips, I dined at several excellent restaurants, including Raku, Beijing Noodle No.9, and Cut. I hope to return to ULVino in 2010, ready to taste some new wines and explore some new restaurants. 2) I also made several short local trips to Maine, Connecticut, and Vermont. In Maine, I made several food and wine stops while in Portland. The highlight of my Connecticut trip was dinner at David Burke Prime Steakhouse. While in Vermont, I attended the Cheesemaker's Festival, and got to try numerous Vermont wines. There is plenty to see and do in New England and it is well worth taking weekend trips to catch the culinary sights. 3) This was also the year for the first TasteCamp, which was held on Long Island. TasteCamp was a small get-together of mainly East Coast wine bloggers. We visited Long Island wineries, tasted many wines, dined together and had an excellent time. It was great to meet some bloggers who I had previously only known online. In 2010, TasteCamp will be held in the Finger Lakes region of New York, and there will be even more bloggers there. I look forward to attending, getting back together with my fellow bloggers, and meeting others new to me. It was my pleasure to meet many more food and bloggers this year. TasteCamp, mentioned above, was an excellent opportunity to meet a number of wine bloggers. I also met other bloggers at various food and wine events this past year, finding some new friends. I think the local blogger community has become closer over the past year, and it also has been good to see new bloggers starting out. Twitter has certainly been very useful in connecting with bloggers from all over. I am sure that in the new year, the community will continue to grow closer and I will meet even more fellow bloggers. It has been a tough year for wine lovers in Massachusetts. First, the Attorney General Martha Coakley appealed the court decision which declared MA House Bill 4498 unconstitutional. When it was declared unconstitutional, there was hope that soon enough, MA residents could order wine directly from wineries. The hearing on the appeal was recently held but we still have to wait several months for a decision. I hope the court upholds the prior court decision and the Attorney General decides not to file any additional appeals. Plus, Governor Deval Patrick approved a 6.25% tax on alcohol. Alcohol had not been taxed prior to that, so this added a significant cost to buying wine, causing some to run to New Hampshire to purchase their alcohol. This tax is unlikely to change any time soon. Saké was very prominent on my blog in 2008 and it has been equally, if not more, prominent in 2009. In fact, it has been so prominent this past year, that I will devote an entire post to a review of Saké happenings this year. So look forward to that real soon. I am very thankful for all of my readers this past year. My readership has continued to grow and I have received more comments on my blog. I am glad for those people who have enjoyed and found my blog posts entertaining and informative. I hope to attract more readers in the new year, as well as to have more of a discussion with those readers I have. Please feel free to add your comments, so we can have a dialogue about the issues and items I write about. At this time of year, some merchants try to maximize their profits, and visits with Santa are used to bring in extra income. There might be a charge to see Santa, or they will provide you a photo of your child with Santa for a hefty fee. Other merchants are more generous, more giving during this holiday time. The Beehive in Boston’s South End falls into the later category, and yesterday I attended, with my nephew and niece, their annual Santa Brunch. We all had a great time, and it didn't cost us any more than their usual brunch prices. First, they did not charge any entry fee for the event. It was free for all to attend. Second, they had their usual brunch menu, and not any special, high-priced limited menu. Third, you got to take your own photos of your child with Santa, and there was no fee. The Beehive was giving you a holiday experience, without charging extra for the pleasure. That is something I really respect. I have always enjoyed brunch at The Beehive. From their hot beignets to start the brunch, to sandwiches like their grilled short rib & fontina. Plus, their home-made frites are addictive! All of us thoroughly enjoyed our meals. The dishes are plentiful, even the kid's meals. The mini-grilled cheese is the same size as the regular sandwich you would get at most other places. It is large enough to satisfy an adult appetite. Despite the restaurant being packed, service was very good. We didn't have to wait for our meals, we got multiple refills on our drinks, and our servers were all pleasant. And as for Santa, they staggered the times to send children up to see him so you did not have to stand in a long line waiting to see him. Santa was excellent, good with the children, and sat for multiple pictures with each child. A very positive experience for all. Kudos to The Beehive for really being in the holiday spirit! Next year, this is the place to take your children to see Santa. In the city, you still can find small, neighborhood markets that cater to nearly all of your food and beverage needs. That is something I wish existed more in the suburbs. The Golden Goose is one such market in the North End, a medium-sized store that is jam packed with a wide assortment of food items, wines, beers and liquors. I was told that the average customer stops by the market 2-4 times a day! Though I had stopped there primarily to check out their wine selection, I could not ignore the rest of their offerings. They have a full service deli, also selling breakfast sandwiches, subs, pizza and other prepared foods. There are baked goods, including bread from Iggys, cheeses, fresh produce, and seafood. There doesn't seem much you can't find here. They prepare all of their own meats on premises, from grinding their burger to making sausages. The meats all looked good, albeit a bit pricier than other butcher shops. I did not spend much time checking prices, though I have heard from some others that food prices tend to be a bit pricey. I didn't take the time to confirm that though, but I might do so on a future trip. I originally met Dave, the wine manager/buyer for Golden Goose when he was working at the OurGlass Wine Store in Saugus. He was knowledgeable and passionate about wine, just the type of person you want running a wine store. When OurGlass closed, Dave went to work at the Golden Goose market and he was there when I stopped by the other day, able to spend a little time chatting to me about their wine. Though a bit cramped, there are about 500 wines packed into the woden racks and boxes. For a grocery store in the North End, you might expect two things: that they would have tons of Italian wines, and mostly carry mass-produced, commercial wines. Yet you would be wrong on both counts. The selection is actually fairly diverse, with wines from all over the world, and the Italian selection is but one portion of the larger whole. And though they do sell some wines like Yellow Tail, they also carry many other wines from small, artisan producers. It is a selection that will interest wine lovers. It is also still being refined and revised by Dave, and I expect the selection to get even better with time. At the rear of this picture, you can see an enclosed cabinet where they keep their higher end wines. They also stock a full complement of speciality beers and ales. Despite their space issues, they have filled this area with plenty of good choices, and you still have the ability to easily scan the stock. They even stock some Sake! Prices of the wine seem average. This is certainly a store worth checking out, with a diverse collection of wines from all over. Plus, you can always pick up some food to accompany your wine. Don't think that this is your average grocery wine store but realize that you will find plenty of gems inside. Have you ever enjoyed aged Nebbiolo? If not, you could buy some recent Nebbiolo wines, at good prices, and cellar them for twenty years or so. Or you could attempt to buy some twenty-year old Nebbiolo, though likely at a very high price. Aged wines often do not come cheap. But sometimes you can find a bargain and should take advantage of it when you can. Such an opportunity exists now and I highly recommend you check it out, especially if you love Italian wines, aged wines, or just good wine in general. A couple months ago, I tasted the wines of Antonio Cerri, Nebbiolo based wines from the tiny Boca region of Italy. You should read my prior post for additional information about this producer. I got to taste wines extending as far back as 1984, wines that are 25 years old! These were generally amazing wines, still very vibrant, and likely to continue aging for another 20 years or more. This past week, I got to taste the wines again at Vintages in Belmont. Jeannie Rogers of Adonna Imports hosted a public tasting of the wines and I was pleased to retaste all of the wines, including the vintages of 1984, 1985, 1987, 1989, and 1991. When comparing my notes from the initial tasting, I actually found a couple of the vintages showing even better than when I first tasted them. This might partially be due to bottle variation. My main reason for attending the tasting though was to actually purchase some of the wines, which have just come onto the market. Only Adonna Imports is bringing them into the U.S., and supplies are limited. After the first tasting, I knew I wanted to buy some of the Cerri wines and the retasting only confirmed my intentions. The price for these wines? Only $58, which I consider a true bargain. These are rare, aged Nebbiolo, which are incredibly delicious and complex. They will continue to age well. Most comparable Nebbiolo would likely sell for a much higher price. If this type of wine appeals to you, then I highly recommend you buy some. You won't regret it. New Tasting Notes: What Do You Think? Rant: Drink Saké Not Bombs! Would You Like To Dine In Hell?